Set of three appliqué hand embroidered pillows. Appliquéd satin on velvets and satin back ground fabrics. Appliqués edged with small glass beads. Multicolored magenta, ochre, navy, olive and dusty pinks. Hand Appliqued Italian Pillow, "Lido"
Italian merino wool tufted and gathered in a nautical pattern on thin wale corduroy. Feather and down insert with hidden zipper. Made in Italy. 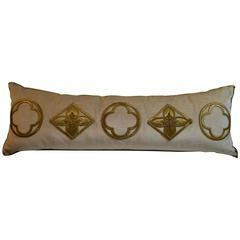 Antique raised gold metallic embroidered appliqué pillow, on oyster velvet. Down filled.